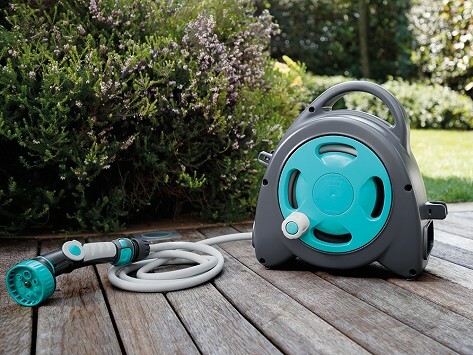 A portable, retractable garden hose reel makes watering the garden easier. The mini hose reel has a three-jet nozzle, is 37.7 feet long, and weighs less than four pounds. The maxi hose has an eight-jet nozzle, is 54 feet long, and weighs around seven pounds. Both can store and be used standing up or be wall-mounted. Made in Italy. Dimensions: Mini: 12" x 5" x 12"; Maxi: 12" x 14" x 7.5"
Weight: Mini: 3.89 lbs. ; Maxi: 6.63 lbs.